Access provides a powerful yet comfortable environment in which you can manage your information. Using Access, you can tame even the most difficult data-management tasks. This chapter is the first step in your journey. Here you will learn basic terms, as well as how to start and exit Access. You will also learn how to get help and even catch a glimpse of what you can do with Access. Before you dive into the Access environment, there are a few terms with which you should be familiar. As such, we'll discuss these terms now and make sure you understand them. Note: As you work through this book, you will undoubtedly come across other new terms. The text defines many of these terms at their first use. You can also use the online Help System to find the definitions of many different Access terms. The following sections discuss the major terms which you must understand before you work with Access. A database is simply a collection of related information. For example, if you gathered together all your photographs, you would have a database of photographs. If you collected all your photographs that included your dog, you would have either a more targeted database or a subset of your larger database. If your database is small (for example, your home insurance policies), you can probably manage the information manually. In such instances, you might use a traditional management method such as a card file or a simple list on a piece of paper. However, as the database becomes larger, your management task becomes more difficult. For example, it would be virtually impossible to manually manage the customer database of a large corporation. This is where your computer and a database management system (DBMS) come in handy. DBMS software (such as Access) lets you manage large amounts of information quickly and easily. In Access, a database consists not just of information, but also the tables into which the information is organized. Access databases also contain related queries, forms, reports, and programming instructions. Because these terms deserve further definition, they are covered in the following sections. In Access, tables contain the actual information in your database. 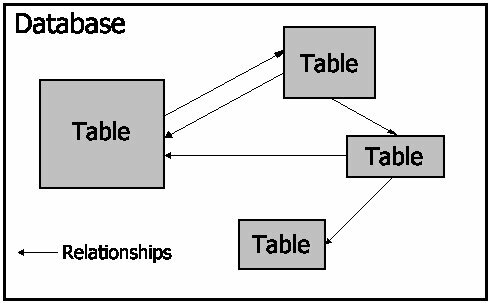 There can be more than one table in a database. The information in each table can relate to information in other tables in your database. For example, you might have one table that contains a record of all the door locks in your building. In the same database, another table might have a list of all the keys for those locks. Still another table might contain the names of all the people who have the keys. All three tables contain related information, so they belong to the same database. 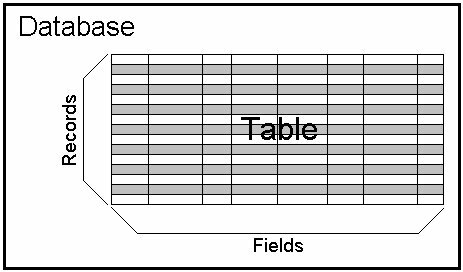 Figure 1-1 depicts the relationship between the tables and this database. Figure 1-1 How Access relates tables and databases. Your first step in creating a database is to determine the information you need. Next, you will use Access to design a table to hold the information. Figure 1-2 illustrates the Design view of Access. You use Design view to specify the framework used for each of your table entries. Figure 1-2 Design view for a table in Access. 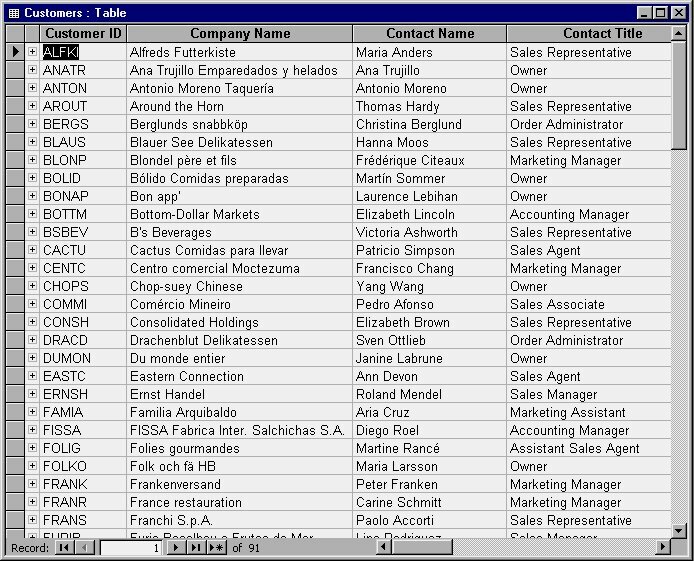 After you design your table or tables, you will use Datasheet view to enter and examine (view) your data. Figure 1-3 illustrates how your data may appear in Datasheet view mode. Figure 1-3 Datasheet view for a table in Access. When you work with large databases, there will be times when you will want to work with specific pieces of your data. For example, if you have a company database, you may want to view the names of all your customers who reside in New York. On such occasions, you would form a query. A query defines which database information you want to view. Think of a query as a question you ask the database, such as "Who are the customers that reside in New York?" For example, if your database contains the names of all your customers who have purchased a particular product, your query might request a list of only those customers that made over a certain income. Another query might request only those customers with children. Essentially, a query limits or filters the information in a database. When you use a query as a filter, Access displays only information that satisfies the query. Why would you use queries? Specifically because you want to work with only a part of your database. Queries make it easy for you to work with only those records that fit a particular criteria. Access lets you get as broad or as specific or as complex as you want in the queries you develop. You will begin to learn about queries in Chapter 6, "Using Queries to Examine Your Data." A database exists to store information. After you determine the information your database will contain, you will need to enter the data. Later, you may want to examine, add to, or change that data. Although you can use the Datasheet view to accomplish each of these tasks, you may want instead to create a custom display screen that lets you enter, view, and edit information. 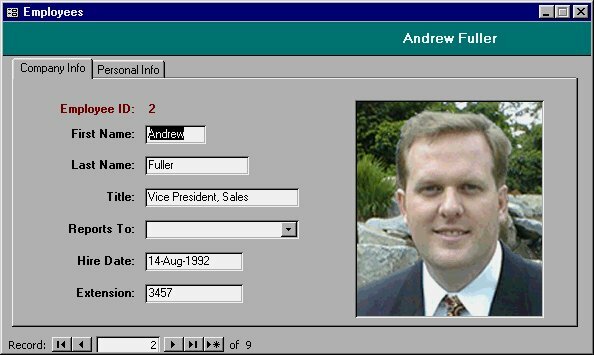 Within Access, custom display screens are called forms. Using forms, you can both display the information in a table and add buttons, text boxes, labels, and other objects that make data entry much easier. Earlier, in Figure 1-3, you saw what a table looked like as a Datasheet. Figure 1-4 shows an example of a form used to input information into the same table. Notice how using the form provides a better interface for the user. Figure 1-4 An example of a form used to enter information in a table. A record is a single block of information, such as employee or customer data. A table is made up of many records. For example, if you have a table that contains information about your baseball card collection, a record is the specific information about a single baseball card. Sometimes, records are referred to as rows because, within a table, Access represents individual records as rows. Just as tables are made up of records, records are made up of fields. A field is the smallest piece of information in a database. For example, if you have a table containing your phone list, each record represents a different person or business in that list. In turn, those records are made up of individual fields (names, addresses, or phone numbers). Figure 1-5 shows the relationship of fields, records, tables, and databases. Figure 1-5 How fields, records, tables, and databases are related. You may also hear fields referred to as columns. 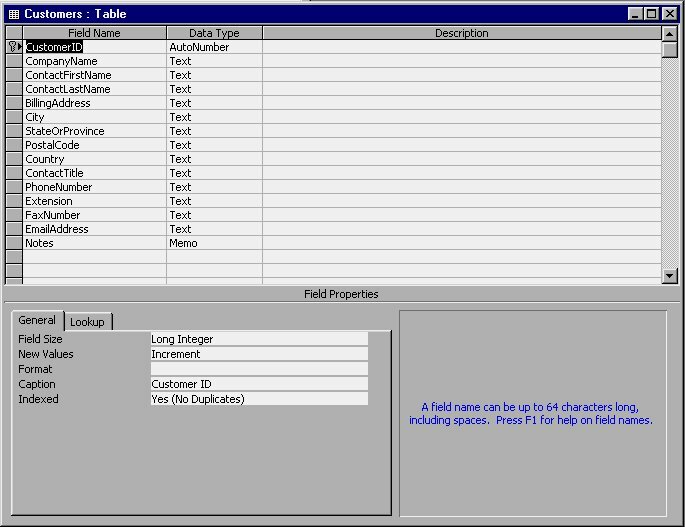 Within tables, Access represents fields as columns when you look at data in Datasheet view (refer back to Figure 1-3).